I finally decided to start taking drawing classes and they have really made a difference. I have learned a ton about perspective and rules of drawing. I drew a self portrait, which everyone agrees looks like someone or everyone in my family. I think it’s a great start! Naomi Ocean, my art teacher and Riki Metz my fellow art student are both incredibly supportive and share so much knowledge. Thanks you guys! I decided to prepare a piece for the Color Palette challenge for the Israel Quilter’s Association. The piece made the cut and is now hanging in the Jerusalem Theater through 15 June 2014. 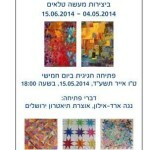 There is an exhibit opening on Thur, 15 May 2014 if you want to join us there. All are welcome. Below is the invitation and a photo of my quilt. My vision of color is the rainbow formed by fruit at the Jerusalem market, Mahaneh Yehuda, which is a very unique place that challenges our senses. The colors, sounds, smells and flavor of the atmosphere tempt us and pull us into this addictive setting. I tried to evoke this feeling in my quilt. Six of my quilts will be shown during July and August 2014 at the Chase Family Gallery at the JCC in Greater Hartford, CT. The theme is Connecting Threads with a Jewish Tone. If you can visit the exhibit, it looks like a lovely gallery. Let me know how it is. I wish I could make it, but at least my quilts will be well traveled! I prepared loads of quilted accessories for the fair at our synagogue. I worked around the clock and have loads of stock now. So, keep that in mind if you need any handmade gifts this summer.